Personally, one of the most difficult situations for me to find myself in is when I’m at a restaurant, or traveling, and trying to make good choices regarding my food selections. It’s something that I’ve gotten better at over the last handful of years or so, and I’d like to share what I’ve learned with you. I want to specifically point out that this is different than having a celebratory, no-strings-attached, no-guilt-allowed meal out on occasion. That should be no more than once a week. Or, when traveling for leisure, shoot for one “free” meal each day. It’s your choice when, but choose when that will be each morning and then make the best choices available during the rest of your day. You’ll come home feeling so much better than if you’d splurged at every meal for the entire trip. Therefore, these tips are for times like when I’ve realized that I forgot to pack my lunch that morning and find myself at the studio without food, or due to be on on the road or in airports all day, etc. Those times are really challenging, and today I want to share some of my favorite strategies to employ when you find yourself in similar situations. Fresh fruit. This is a big change in the last few years, but I’ve found that things like bananas and apples are now pretty readily available. Look near the register or open-air refrigeration units. Ask if you don’t see them! Just stay away from dried fruit as it’s likely loaded with sugar. Nuts, unsalted is best. No mesquite seasoning on those almonds, please! Pre-made salads. A bit harder to find on the road, but likely available in the airport and on the train. Leave the dressing off! Cheese sticks, hard-boiled eggs, and turkey jerky. For when you feel like you really need protein. Last resort – granola bars and protein bars. Read the ingredient label and nutrition facts and stay away from anything over 200 calories or with sugar in the first 5 ingredients, if possible. Most of them aren’t much better than a candy bar, so choose carefully! 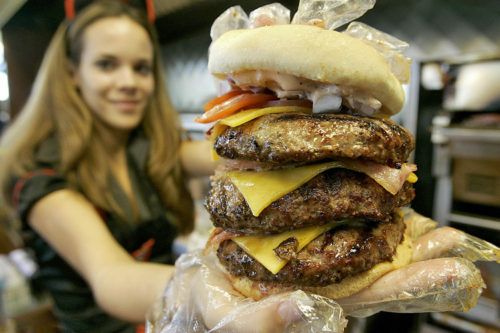 We know that portion sizes at restaurants are over-sized, ridiculously so. If you’re at a sit-down establishment, ask for half your meal to be brought to you already packaged up in to-go containers. When you’re presented with a giant plate of food, you’re much more likely to keep eating even if you’re full, simply because it’s there. Even if you tell yourself you’ll only eat half, you probably will eat more than that. Take the temptation away by not even having it presented to you in the first place. Plus, you’re guaranteed to get two meals out of it! If you’re traveling and won’t have a way to store the to-go items, look for a homeless person to give your meal to instead. If you don’t want to hassle with that, ask to be served a child’s portion, or half-portion instead. They might not cut you a deal on the bill, but you’ll save your waistline. Looking over menu items for the healthiest choices is a bit trickier. Salads seem like a safe choice, but at restaurants they’re often loaded down with some questionable items and excess amounts of dressing. Salads ARE a decent place to start, but I suggest asking for some tweaks. Perhaps the taco salad in a regular bowl instead of a fried tortilla shell. Grilled chicken instead of fried. Hold the won-ton strips. And the biggie – get the dressing on the side and don’t pour it on top. Dressings can turn the healthiest of salads into a fat, sugar, sodium laden nightmare. Dip your fork into the dressing before each bite – you’ll get a nice little taste of the dressing and likely consume at least half as much as you would have otherwise. You might even discover that the mix of ingredients in the salad is tasty enough without the dressing at all! Non-cream based soups are often a pretty good choice too, but get a cup, not a bowl. You won’t be able to make many changes, but restaurants will often put cheese or croutons on top that you can ask them to leave off. Onion soup, for instance, will likely be high in sodium but low in calories – as long as the bread and cheese is left off. Burgers, sandwiches and wraps are do-able too. Even if they offer a whole-wheat bun or bread, it’s likely not 100% whole grain, but ask. Then you’ve got a choice to make – go with the 100% whole grain bread, or ask for it to be lettuce wrapped. If those aren’t options, be prepared to remove the bun/bread/tortilla when it arrives. Eat what’s left with a knife and fork. Ask for all condiments and sauces to be left off, but load it up with as many veggies as they’ll let you. Pastas are tricky. Scour the menu and see if they have at least one whole grain pasta choice. If they do, they should be able to use that in any other pasta dish. Then look for a non-cream based sauce and really watch your portion size! Sides are frankly the easiest thing as green salads are often listed. Get it without dressing (or dressing on the side if you must), and literally start there. When your food arrives, eat the veggies first to help you fill up. If other veggies are choices, great! As long as they’re not covered in butter or cheese, you’re golden. Ethnic foods present a whole other host of challenges. My advice is find something with lots of veggies and whole grains. Ask lots of questions of your wait staff (that’s what they’re there for – but please tip them well if they’re particularly helpful), and again, watch those portions. If you’ve gone to a location where they bring you breadsticks or rolls for the table – ask them not to! There’s nothing beneficial in that basket, and why risk the temptation and the stress to your willpower? Drink only water or unsweetened tea. Iced, room temp or hot – take your pick. Don’t drink your calories! If YOU have strategies to help you stick to “the plan” when traveling or eating out, please share them in the comments below!